The Golden Whip Stream is well-known for “Suffering from thousand years of drought, its water will never run dry; Suffering from endless excessive rain, its water will always be green”. The Golden Whip Stream is one of the most beautiful valleys in the world. It is about 7.5km long and 30-50m wide, with the average height of peaks on both sides up to 300-500m. 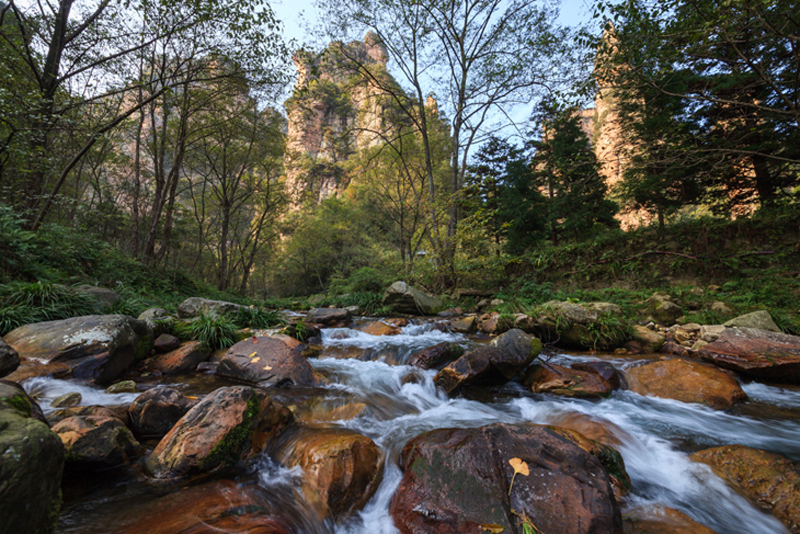 The Golden Whip Stream is like a blue silk ribbon around the matchless beauty-Zhangjiajie. It displays the beauty of “300 strange peaks and eight hundred fine waters’ to the utmost. 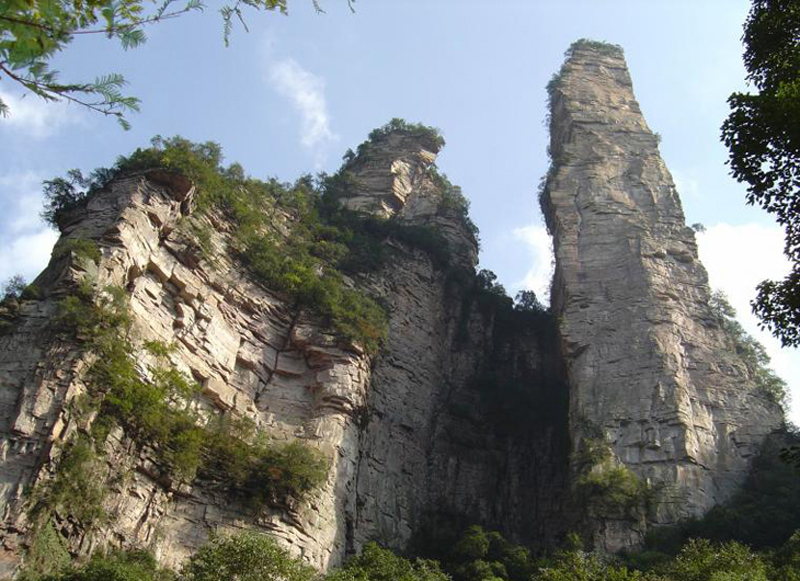 Mr. Shen Congwen, a famous Chinese writer, praised it to be “maid of Zhangjiajie”. Wu Guangzhong-the then image promoter of Zhangjiajie and a famous Chinese painter, praised it as “a world in Children stories”. There are many national protected plants on both sides of the stream such as the dove tree. It is a perennial woody flower, which generally blossoms in the end of spring and beginning of summer. The flower is white, but its stigma has slight purplish red, like a dove’s head and mouth, and its flower has two long and big bracts, like a pair of wings. The whole shape of the flower is like a flying dove. This is a peculiar kind of trees of China and foreign friends endearingly call it “the Chinese Dove Flower”. And there are many metasequoia, which is also one of the national first-class protective plants. The dawn redwood is a very ancient tree. People once thought it had thoroughly disappeared as a result of the assault by the Quaternary Period Glacier. In 1941, the botanist of our country discovered it in Modaogou of Wanxian, Sichuan Province. 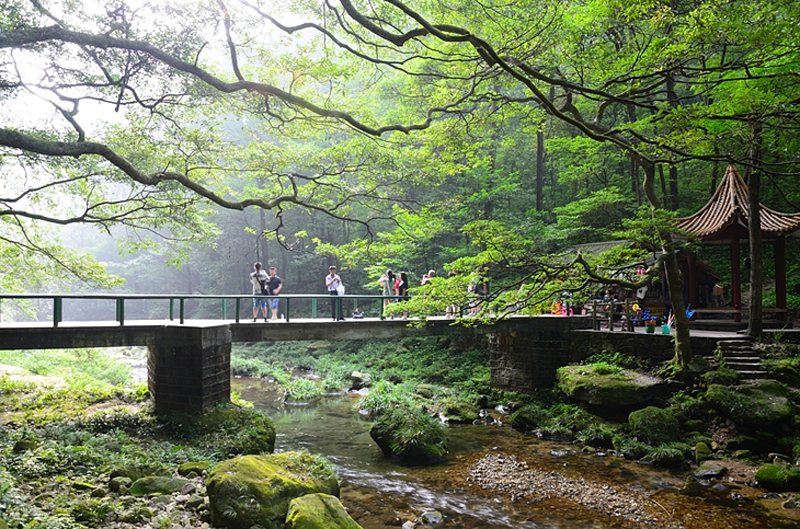 In 1982, when Zhangjiajie was developed, we found large areas of dawn redwood and other rare plants of over 3000 species growing here. This is really a huge wealth the great nature has bestowed us.